The Echinoblog: Starfish Alert! Paleontologist Dan Blake Wins Gilbert Harris Award from PRI! Starfish Alert! Paleontologist Dan Blake Wins Gilbert Harris Award from PRI! The Gilbert Harris Award is presented annually by the Paleontological Research Institution in recognition of career excellence in systematic paleontology. It is named after the founder of PRI, Gilbert Dennison Harris (1864-1952), whose commitment to systematic paleontology was legendary. The annual recipient is a scientist who, through outstanding research and commitment to the centrality of systematics in paleontology, has made a significant contribution to the science. PRI is pleased to announce that this year’s recipient is Dr. Daniel B. Blake, Professor Emeritus of Paleobiology in the Department of Geology at the University of Illinois Urbana-Champaign. Dr. Blake’s contributions to the field of systematic paleontology, particularly of stelleroid echinoderms and bryozoans, have been significant and far-reaching. He was part of a large team that revised the bryozoanTreatise of Invertebrate Paleontology in the early 1980s, and his work on Rhabdomesina is still the benchmark for systematics of this group. According to his nominating colleagues, he is essentially the only paleontologist who specializes in the fossil record of the Asteroidea, and it is for his systematic and phylogenetic work with this group that he is best known. His approach, combining a critical understanding of functional morphology with deep geologic knowledge of their history, has allowed him to develop a cladistic approach to their phylogeny that serves as a model for all. He might also be the only person in the world to have examined representative specimens of every known genus of modern and fossil seastar. He currently serves as lead author on the upcoming revision of the Treatise Asterozoa volume. Dr. Blake’s publication record is extensive and influential. In addition, he was for many years the influential editor of the Journal of Paleontology, one of the premier journals of paleosystematics. Working at a time when manuscript exchange was done via the U. S. Mail, he was essentially a one-man show. His standards were high and unyielding, and many paleontologists remember the rigorous comments they received on their manuscripts. His dedication to science and the journal contributed to the high quality of that publication today. Dr. Blake is also lauded as an excellent field geologist, a respected mentor of students in systematic paleontology, and a friend and supporter of amateur collectors. 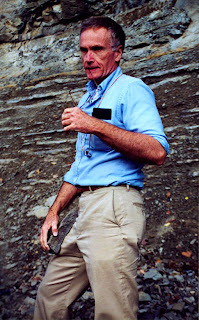 It is with pleasure and honor that the Paleontological Research Institution presents its 2012 Gilbert Harris Award to Dr. Daniel B. Blake. Dan Blake was my PhD advisor and I (as well as his many students!) are excited to see that his expertise is being appreciated and honored! And here is an account of how he became an echinoderm scientist! A recent paper that we have coauthored together in PLoS One!